The movie is mostly about Finkel. It starts with his investigating a story about African slave trade, then establishing how successful he is, but moving on to the quick reveal of what he fabricated. Back home in his cold and desolate log house in Montana, he receives a call from another reporter asking him about accused murderer Christian Longo using his name as an alias. Finkel knows nothing about this, but ends up travelling to the Oregon prison to meet him and try to find out why. Longo says that he's very impressed with his writing, that it was a sign of respect, and he'll give him an exclusive on his story if in turn, Finkel will teach him to write. Finkel agrees. And thus the movie is the story about Finkel learning and writing the story about Longo's life. (L-R) Jonah Hill as "Mike Finkel" and James Franco as "Christian Longo"
Century Fox Film Corporation All Rights Reserved. Longo loved playing with Finkel's mind, but I'm not sure what the film expected to get out of this section, because we just got a lot of boring scenes of Finkel reading letters from Longo detailing some stories from his childhood and life before the murders, told as uninterestingly as possible. Longo's letters would include pencil drawings of things he felt and the camera would love to zoom in on them, suggesting he might be a psychopath. Obviously he's a psychopath, you don't get yourself on the FBI Most Wanted list and accused of murdering your wife and three children for being normal. 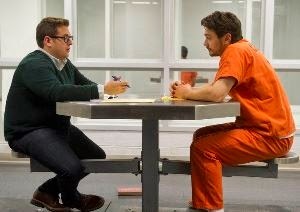 James Franco outshone Jonah Hill. Finkel had the more dramatic character arc, but Longo loved to play with Finkel's mind, torture him psychologically (even if Finkel didn't realize it) and distort his expectations (the audiences' as well) so you don't know where he's taking us. He would act like he killed them, implying that he killed them, but then saying that he didn't, even though he never got as far as saying what actually happened on the night in question. Until the trial. The trial offers the next good turn in the movie, because backstory can only keep us interested for so long. The trial and the aftermath finally reveals what he's lying about, what his end game was, and how far it could take Michael Finkel. Felicity Jones, as Finkel's wife, was extremely effective in her few scenes. She never trusted Longo and was an excellent touch point for when we needed to get out of the prison visitation room and into a grounded reality. True Story does have a fairly interesting story but it's stretched out and over-wrought with close-ups of eyeballs and an unncessarily austere atmosphere just to make sure we know this is a dramatic story. Finkel believes everybody deserves to have their story heard, and I love all of his points for wanting to meet and work with Longo, but he was missing a connection to help pull the audience into his mind. Devil's Knot (2013) - An affecting film of injustice, corruption and hopelessness in Arkansas 1993 (or Salem 1693).